While doing research for my biography of Bee Ho Gray, I kept coming across information on another Wild West star named Tex McLeod. Everywhere I found Bee Ho, I also found Tex. It turns out they were friendly rivals, or perhaps bitter friends. Along the way, I decided to start collecting web site addresses, magazine and newspaper articles, book references and photographs. I then had the luck of acquiring the interview notes compiled by a writer who was a friend of Tex. By the time I had finished the book about Bee Ho, I realized I had enough information to start writing a book about Tex. 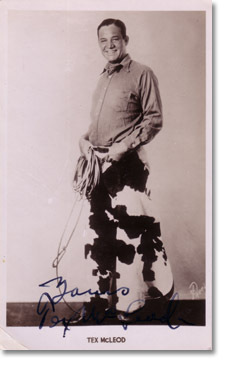 Alexander "Tex" McLeod was born on November 11, 1889 in a small town east of Austin, Texas. His father had immigrated to Texas from Scotland. His mother was of Spanish extraction but her family had first settled in Peru for several decades before moving to Texas. Tex was destined for a life of roaming adventure starting at the age of 10 when he first started running away from home to spend time on the open range. His father, a school teacher, dreamed of seeing his son become a concert violinist. Tex, however, had other ambitions and by the age of 12 had taken his first job on a ranch some fifty miles away from home. Within a few years, as Tex matured to become a man of 6 foot 2 inches, he proved his skill as a cowboy among the rough-and-tumble world of bucking contests. These first rodeos, which were called round-ups at the time, gave Tex an understanding that there was money to be made in this new competitive sport. Tex went on to earn several large prizes and World Champion titles in bronco riding, trick roping and wild horse racing. These events were just the first steps in what would become an amazing 50-year career as a star in Wild West shows (including Buffalo Bills Wild West), circus, stage performances, and silent films. Tex traveled around the globe, from South Africa to Australia, where he put on his comic roping routine to the delight of thousands. Tex relocated to England in 1919 and quickly became a headlining star in some of the most opulent night clubs and variety theatres and enjoyed a great deal of fame in England, America and many other countries. He befriended everyone from famous painters and actors to British Royalty, even providing private lessons in trick roping to several members of the Royal Family. He was still in touch with the Duke of Norfolk decades after they first met. His life, while adventurous, was also plagued by the harsh realities of life on the road, including failed marriages and estranged children. As he grew too old to continue his life as an entertainer, he settled into his home at 26 Tidy Street in Brighton, England, where he ran a boarding house for homeless men. Tex died in early 1973. Even his death was out of the ordinary. I would much appreciate any memories, photographs or other assistance in gathering information on this unusual character, who was loved by many but remembered by few. If you have any such information, please contact me.